In today’s climate airports and ATC providers face many challenges, not least the pressure to consistently deliver more capacity at lower cost. A key challenge for airports is to consistently deliver more capacity at lower cost. Infrastructure development and schedule co-ordination can help solve these issues. In a safety critical environment, making operational changes with confidence requires the right information at the touch of a button. Working together in close collaboration, NATS and Heathrow implemented ACM in April 2014. 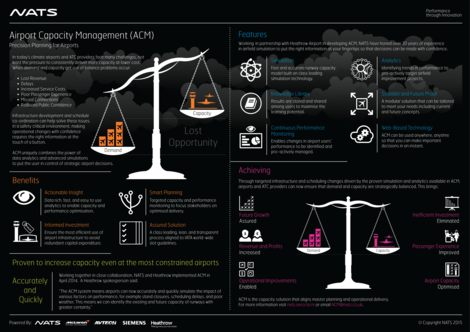 Working in close collaboration, NATS and Heathrow implemented ACM in 2014. Actionable Insight. 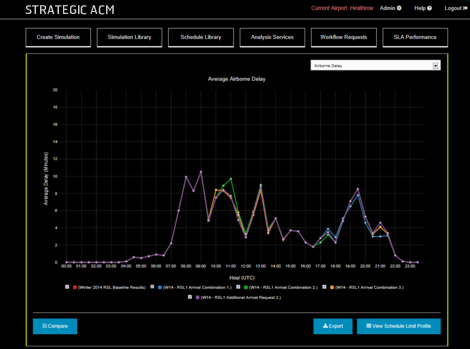 Data rich, fast, and easy to use analytics to enable capacity and performance optimisation. Smart Planning. Targeted capacity and performance monitoring to focus stakeholders on optimised delivery. Informed Investment. Ensure the most efficient use of airport infrastructure to avoid redundant capital expenditure. Assured Solution. A class leading, lean, and transparent process aligned to IATA world-wide slot guidelines. Working in partnership with Heathrow Airport, NATS has honed over 30 years of experience in airfield simulation to put the right information at your fingertips so that decisions can be made with confidence. ACM can be used anywhere, anytime to empower rapid decision making. Simulation. Fast and accurate runway capacity model built on class leading simulation technology. Analytics. Identifying trends in performance to pro-actively target airfield improvement projects. Knowledge library. Results are stored and shared among users to maximise the learning potential. Scalable and Future Proof. A modular solution that can be tailored to meet your needs including current and future concepts. Continuous Performance Monitoring. Enables changes in airport users’ performance to be identified and pro-actively managed. Web-Based Technology. ACM can be used anywhere, anytime so that you can make important decisions in an instant. Watch our video or view our infographic below to learn more about ACM. Click on the thumbnail below for a larger version of our infographic, or download it here.